Saturday for the NEC thus avoiding the traffic and arriving in advance of the show’s opening at 1000. We had often wondered if there was any real benefit to the early alarm call; the answer is a resounding yes. A necessary errand delayed our departure but by 0915 we were enroute with an ETA of 1040 according to the satnav. Of course we are far superior to the satnav and chose to approach the NEC via the M6 Toll thus avoiding congestion. An unplanned detour took us to Sutton Coldfield and back to the motorway we had left 15 minutes earlier. We joined the traffic jam and made our way to the NEC at a rate slower than Al the snail. We campers are civilised though and everyone merged politely in turn. At 1130 we were still queuing to get into a car park. Traffic was well marshalled by the men in yellow jackets and we were eventually directed to a spot in North 3 car park. After a long walk we finally arrived at the show just after midday. We had arranged to meet with friends, two of whom also spent Saturday morning in the Birmingham traffic. The others had wisely left home early and avoided the queues. You know, like we usually do. Our hobby can be incredibly sociable. So what happens when you combine campers with a social networking site like Twitter? A group of strangers agree to meet at the NEC, that’s what happens. Four of us had met before and the fifth and his family were instantly recognisable from their online photographs. Enthusiastic greetings ensued and it felt like we were in the company of old friends. Coffee was our first priority. Quality and price varies between NEC outlets and none was cheap. Finding a table for seven was impossible so we propped ourselves up against a metal bar. My advice would be to take a flask of coffee and some homemade cake. Lunch was costly but there were fewer of us and at least we had a table. A second coffee get together in the afternoon was also enjoyed leaning against a metal bar. NEC please provide more seats. Coffee however was second place to conversation and we chatted contentedly about everything under the sun before wandering off together to look at caravans. There was even talk of a potential Twitter caravan rally. 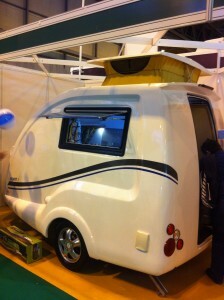 Readers of my previous articles will know we plan to purchase a Bailey Orion 400-2 later this year. One of our concerns was the capacity to entertain at rallies or when friends and family visit. The presence of friends enabled us to prove the Orion more than fulfils our needs and hopefully next time we’re in one together it will be on a campsite enjoying coffee, cake and animated conversation. Next stop was the Buccaneer Fluyt which one of our group had recently purchased. We had admired photographs but seeing one in the flesh only served to reinforce what an elegant choice he and his wife had made. We wish them many happy holidays in their new purchase. On to the Eterniti stand where we hoped to catch up with Adam who was so engaging in Manchester. He was busy with a customer so we left him in peace, hopefully to seal a deal, while we inspected the new Chronicle EB2. With an MTPLM of 1450kg our car would refuse to tow this two berth caravan with a price tag of £21,999 inc VAT. The slide out in this instance results in an L-shaped kitchen with excellent workspace. From one extreme to another, we were keen to see the Going Cockpit S with an MTPLM of 750kg which is priced at under £8,000. This micro tourer has a pop-up roof and sleeps two. As well as a two burner hob and sink the Cockpit comes with a portable loo, cool box and electric hook-up. Although four of us squeezed inside it is more suited to one or two people. A rear awning is available to further expand the living space. 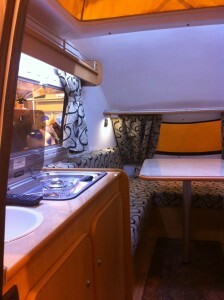 The Cockpit will enable owners of many smaller cars to enjoy caravanning. Of course the show encompasses far more than caravans. Our friends had a particular interest in VW conversions. 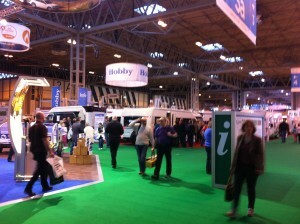 Having subjected them to caravans it was only fair to look at camper vans too. Wow! What a revelation that was. There were some really clever conversions. We all fell for one in particular and I think it has provided inspiration for a future project. We found a great coffee shop in the NEC which sold delicious pastries. By the time we had eaten them and chatted yet some more it was time to depart. Our car was in solitary splendour in the car park. The men in yellow jackets had given up and we exited the NEC complex quickly and were soon on the motorway heading south. My top tip for the NEC? Have one last coffee, cake and chat to avoid congestion. 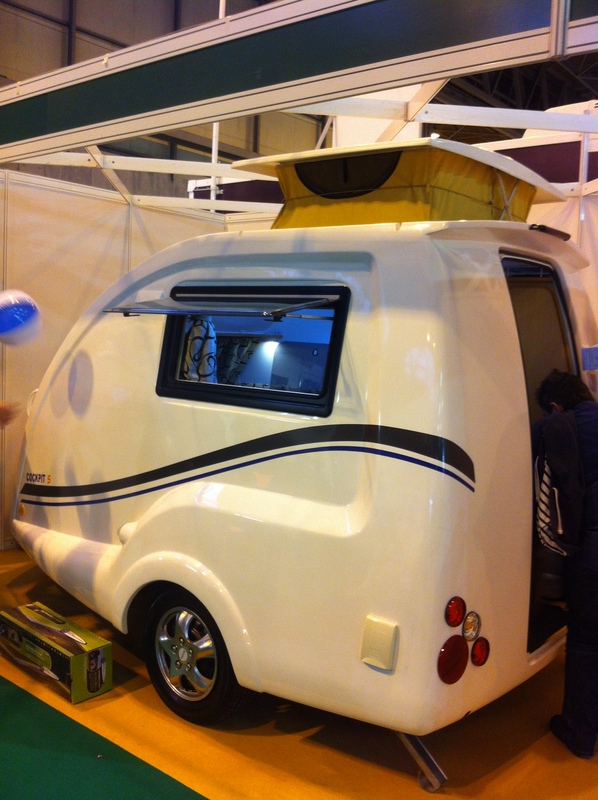 The Spring Caravan & Camping Show is a great day out whether you like caravans, tents or camper vans. It is an even better day out with friends who share your interest. No camping friends? Join Twitter or another social networking forum. 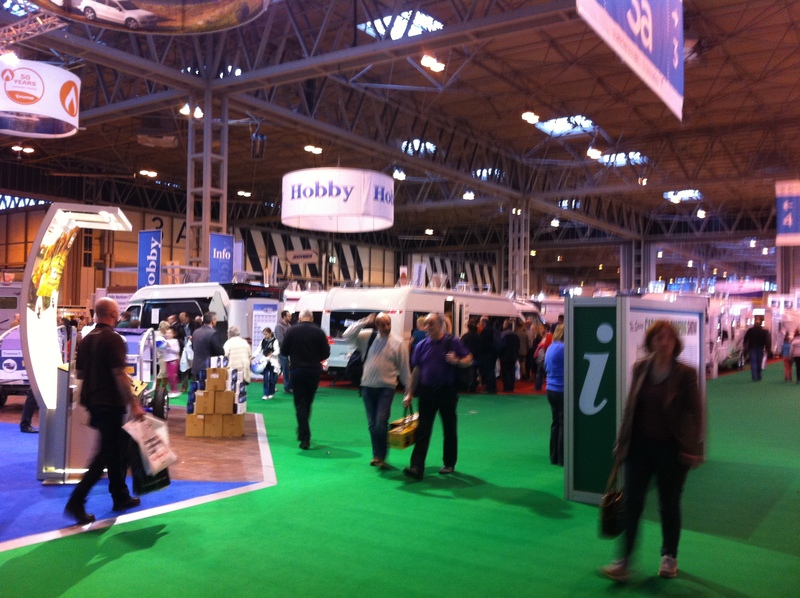 A word of caution though; always meet in a public place, for example a camping show. This article is dedicated to our Twitter Buddies, many of whom we now consider to be true friends. You know who you are and we hope to see you on a campsite very soon.